The year is half over. Michael and Janet Grayâ€™s vacation schedule. Silicon Valley Tax Professionals Save The Date! See David Lazaronyâ€™s art online and in person. Tax extenders bill dies in the Senate. Severance payments might not be subject to FICA. New payroll tax deposit requirements. IRS recognizes community property rights of California domestic partners. Does your out of state LLC have to pay a California tax? Flexible spending plans must be amended. Can our S Corporation pay for our daughtersâ€™ health insurance? Follow me on Twitter, Facebook and LinkedIn! 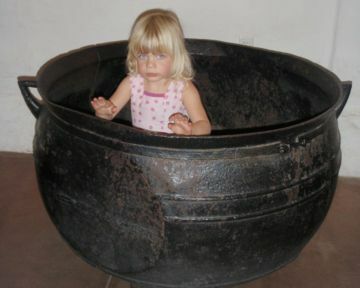 My granddaughter, Kara Siemer, in a cauldron at Mission San Jose. This Sunday is Independence Day. Itâ€™s a great time to reflect on the principles our country was founded on. To me, these include limited government, self reliance and freedom of expression and action. These are challenging ideals to preserve. Our office will be closed on Monday, July 5. The year is half over! Kind of sneaked up on you, didnâ€™t it? Is it time to redouble your efforts to meet your goals for this year? How can we help? Janet and I are headed to Washington state for a family-oriented vacation. Iâ€™ll be out of the office from July 19 through 23. If you need help during that time, call Thi Nguyen, CPA at 408-918-3163. Do you need help with finishing extended income tax returns, preparing amended income tax returns, or tax audits? Now that April 15 has passed, itâ€™s time to focus on finishing extended income tax returns. Some of our readers have found errors in or are uncomfortable with tax returns that they prepared using tax software or were prepared by other tax return preparation companies. We can provide a second opinion. Others have received notices for tax audits and sometimes canâ€™t get the help they need from their tax return preparer. We can help with all of these. To make an appointment, call Dawn Siemer Mondays, Wednesdays or Fridays at 408-918-3162 from 9 a.m. to 5:00 p.m. Pacific Time. Michael Gray, CPA will be giving a seminar on Thursday, July 15, Post Mortem Planning, for the Estate and Trust Interest Group of the San Jose Silicon Valley CPAs. The seminar will be a luncheon meeting at Abbott, Stringhan and Lynch in San Jose from noon to 1:30 p.m. For details, visit the CalCPA web site at www.calcpa.org or call Stephanie Stewart at 408-983-1122. The Republicans blocked tax extender legislation included in an unemployment extender bill with a filibuster in the Senate. This is one of the most difficult tax planning years in recent memory because the Bush tax cuts expire after 2010. A Federal District Court in Michigan has ruled that severance payments relating to layoffs for a bankrupt corporation are a form of supplemental unemployment compensation and therefore not subject to employment taxes. This ruling is in conflict with a Federal Circuit Court of Appeals ruling, CSX Corporation, 2008-1 USTC Â¶ 50,218. Although the IRS does not agree with (and plans to appeal) the new ruling, many employers are filing refund claims for severance payments made relating to layoffs of employees during the current recession. The risk of litigation may be high, but some companies could have substantial refunds. If you wish, we can help prepare a claim. Most employers will be required to make electronic deposits of federal payroll taxes after 2010. Only employers that have $2,500 or less in quarterly federal employment tax deposits paid with their payroll tax returns will be able to avoid electronic deposits. IRS recognizes community property rights of California registered domestic partners. The IRS has issued two rulings that recognize community property rights of California registered domestic partners (RDPs). The rulings represent a change in position from CCA 200608038, an earlier Chief Counsel Advice. The IRS justified the change based on California Senate Bill 1827, enacted September 29, 2006. That law repealed a previous law that provided that "earned income may not be treated as community property for state income tax purposes." Based on this change, the IRS says that each RDP should now report their one-half community property interest of Form W-2 income on their separate federal income tax returns. In addition, each RDP is entitled to claim their one-half share of income tax withholding on their separate income tax returns. Finally, the one-half community property interest in wages of the non-working spouse is not a taxable gift. They are simply vested by law in the partner. The rulings are effective for tax years beginning after December 31, 2006. For tax years beginning before June 1, 2010, Callifornia RDPs may, but are not required to, amend their income tax returns to conform to the new policy. California real estate owners should be receiving notices of assessed value for their properties about now. The Santa Clara County Assessor has attempted to make valuation adjustments for property value declines. If you feel your property has been overvalued, you may file an appeal. In Alameda, Ino, Kings, Monterey, Orange, Placer, San Francisco, San Luis Obispo, Santa Clara, Sierra, Sutter and Ventura Counties, the time during which an appeal may be filed is July 2, 2010 through September 15, 2010. The deadline for other California counties is November 30, 2010. You might be able to avoid having to file a formal appeal if you talk to a representative at the county assessorâ€™s office first. Remember you must pay your property tax bill on time, even if you have an appeal in process. Let us know if you want our help to prepare an appeal. The Franchise Tax Board has recently said that some out of state LLCs owned by California taxpayers may not have to pay the annual California tax. In most cases, ownership of an out-of-state LLC by a California resident that is actively involved in the business of the LLC is sufficient to be considered "doing business in California" and subject to the annual California tax and fee. If the California resident member is purely passive and has no right to and, in fact, does not act on behalf of the foreign LLC in any capacity, that memberâ€™s ownership would not deem the foreign LLC to be doing business in California. If the out of state LLC was formed solely for asset protection purposes, such as to hold a vacation property, and the LLC has no business activity, the LLC is not "doing business in" California and therefore not subject to Californiaâ€™s annual fee and tax. The exception will not apply if there was any rental income for the property or if it was advertised as available for rent. Section 125 plans that permit employees to pay for medical benefits on a pre-tax basis must be amended by December 31, 2010 to allow for coverage of employeesâ€™ children under age 27. The plans canâ€™t exclude them starting with the first plan year beginning after September 22, 2010. Companies can permit immediate coverage but will have to amend the plan retroactively by December 31, 2010. Financial Insider Weekly is broadcast in San Jose and Campbell on Wednesdays at 4:30 p.m., Pacific Time. Starting August 17, the broadcast time will change to 7 p.m. You can watch it on Comcast channel 15 for those cities. The show is broadcast as streaming video at the same time at www.creatvsj.org. July 7, Attorney Scott Haislett, "1031 exchanges of real estate"
July 14, Attorney Scott Haislett, "Sale of a principal residence"
July 21, Attorney Naomi Comfort of Hawks & Comfort, LLP, "Special needs trusts"
July 28, Peggy Martin, ChFC of The Family Wealth Consulting Group, "The role of life insurance in your estate and financial planning"
August 4, Geraldine Barry, President of San Jose Real Estate Investors Association, "How I got started investing in real estate"
August 11, Professor Patricia Cain of Santa Clara University, School of Law, "Recent developments for federal taxation of California registered domestic partners"
August 18 Scott Haislet, Attorney and CPA, "California Short Sales and Foreclosures"
Friday at 6:00 p.m. on Comcast and Astound channel 29 in San Francisco with online streaming video at www.bavc.org, "public access TV". My husband and I are shareholders in an S corporation. We have three daughters and one daughter-in-law working for us. My husband and I do not have health insurance through the S corporation. Two of our daughters and our daughter-in-law are considering getting health insurance through the S corp. The S corp will pay part of the premium and the employee will pay the balance. Can they be included in the Section 125 plan for the employee-paid portion of the health insurance? Since the shareholders donâ€™t have a health insurance policy through the S corporation, does the portion the company pays need to go on the W-2 as S corp health insurance? I am not a super expert on employee benefits and the IRS hasnâ€™t issued a ruling that I am aware of for Section 125 (cafeteria or flexible spending accounts) for S corporations. I donâ€™t see any prohibition from your daughters or daughter-in-law participating in the Section 125 plan. According to Internal Revenue Code Section 1372, for employee benefits, 2 percent S corporation shareholders, including persons considered as owning stock under Internal Revenue Code Section 318, are taxed as partners for their employee benefits. Under Section 318, children are considered owning their parentsâ€™ stock, so your daughters are subject to that limitation. The IRS has issued Revenue Ruling 91-26, Announcement 92-16, and Notice 2008-1 with guidance about how health insurance benefits should be treated when an S corporation provides health insurance to shareholders owning 2% or more of the corporate stock (2 percent shareholders), including their children. The health insurance payments (apparently including those paid through the Section 125 plan) are treated as additional wages paid by the S corporation and 100% of the amount is deducted at line 29 of Form 1040 as self-employed medical insurance. The amount paid for the medical insurance (apparently including the amount paid through the Section 125 plan) should be reported on Form W-2 as S corp health insurance. The wages attributable to the medical insurance shouldnâ€™t be subject to employment taxes. Since your daughter-in-law is not your child, she is treated like other employees and is not subject to the 2 percent S corp shareholder limitations. I'm also on Facebook and LinkedIn. you can also follow me on other social media sites, Facebook and LinkedIn. IRS Circular 230 Disclosure: As required by U.S. Treasury Regulations, you are hereby advised that any written tax advice contained in this communication was not written or intended to be used (and cannot be used) by any taxpayer for the purpose of avoiding penalties that may be imposed under the U.S. Internal Revenue Code. P.S. My daughter and her husband, Holly and Dan Baker, have a Southern French Restaurant at 23 Ross Common, Ross, California, about 15 minutes north of the Golden Gate Bridge. The name of the restaurant is MarchÃ© Aux Fleurs and their website address is marcheauxfleursrestaurant.com. For the best meal of your life, call 415-925-9200 for a reservation and give them a try! For directions, visit our website at taxtrimmers.com/directions.shtml.